Relievers? We don't need no relievers! 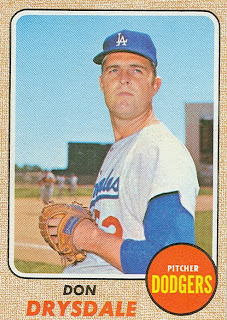 Drysdale made his major-league debut in April 1956, and played his entire 14-year career with the Dodgers, retiring after the 1969 season. He won 25 games and the Cy Young Award in 1962, and won 23 games in 1965. 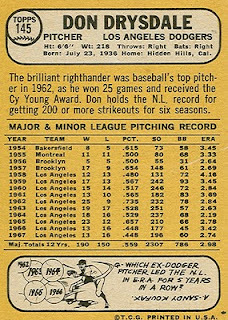 He also led the league in strikeouts 3 times between 1959 and 1962. In 1968, he set a record by pitching 58 consecutive scoreless innings. 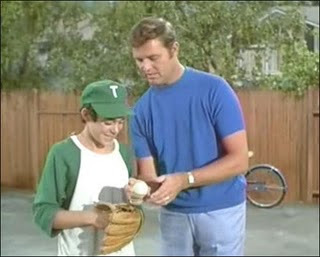 Hello, I enjoyed reading your writings regarding Don Drysdale and his 1968 card. He was a great pitcher (even though he was a Dodger).I am a NY Yankees and Detroit Tigers fan. I remember the great World Series games between the Dodgers and the Yankees in the 50's. I was a 13 year old kid when the Dodgers won the 1955 World Series. I was heart broken. I was just the opposite when Don Larsen pitched his Perfect Game No Hitter in 1956. I lived in Detroit in 1968 when the Tigers won the World Series over the St. Louis Cardinals. Three Great Pitchers performed. Bob Gibson, Denny Mc Clain and Mickey Locich. I opened my first Baseball Card Shop in Northern California in 1991, a second in 2001, now I have retired to Kentucky I opened my third shop in 2006 (how about those 2009-10 Kentucky Wild Cats Basket Ball team). I love Sports and I look forward to reading more of your writings. God Bless! J Hines - aka - "The Sports Professor at Kentucky Blue. Just watched the highlights of the 1963 World Series Game 3, where Drysdale out-dueled Jim Boutin to beat the Yankees 1-0 on their way to a 4 game sweep. To have a guy like that as your number two pitcher, wow!